Catch them while you can! Touring sensation Vulgargrad – Kings of Russian Criminal Sounds , stripe-shirted, vodka swirling firebrand have finally landed after touring Europe. Defying description one thing is for sure, they might sing in Russian but they are a foot-stomping, power-punching music experience not to be missed. Elements of Gypsy, perestroika punk, rhumba, jazz and pop: they’ve got it all, not to mention the raspy accomplished actor / singer Jacek Koman who will take you on a lyrical journey of lowlifes and songs about women. Supported by the equally masterful touring band Unified Gecko who bring middle eastern Turkish boogie colliding with reggae vibe and gypsy rhythm to spread their fat n funky brand of gypfunk and Vardos trio who bring Balkan beats and traveller songs from legend to burning laments and you’re in for a night of ethnic folk fantastic! All monies raised support artists playing at the Karavan International Gypsy Music Festival. You just never know where or when VulgarGrad are going to turn up next, sweeping down from the frozen north on wings of barbed wire and tattered Russian songbooks. 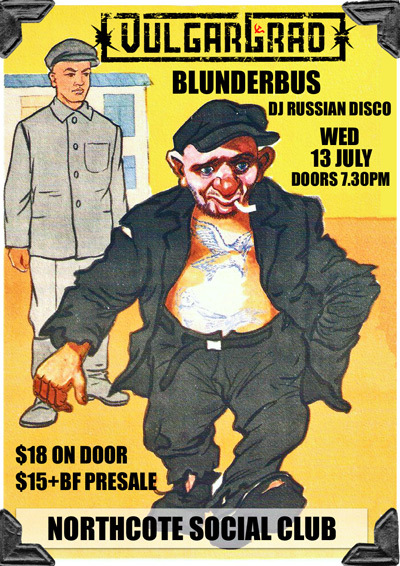 Wednesday, 13 July at the Northcote Social Club is one of those rare occasions, and it’s seriously the last time they’ll be playing their raucous Russian criminal folk-punk-ska in Melbourne this year. Jacek Koman and the gang then go back to the jailhouse to practice for their inaugural European tour later in 2011. In an incredibly special event, you get not just one shot of wild Russian tunes, but THREE. 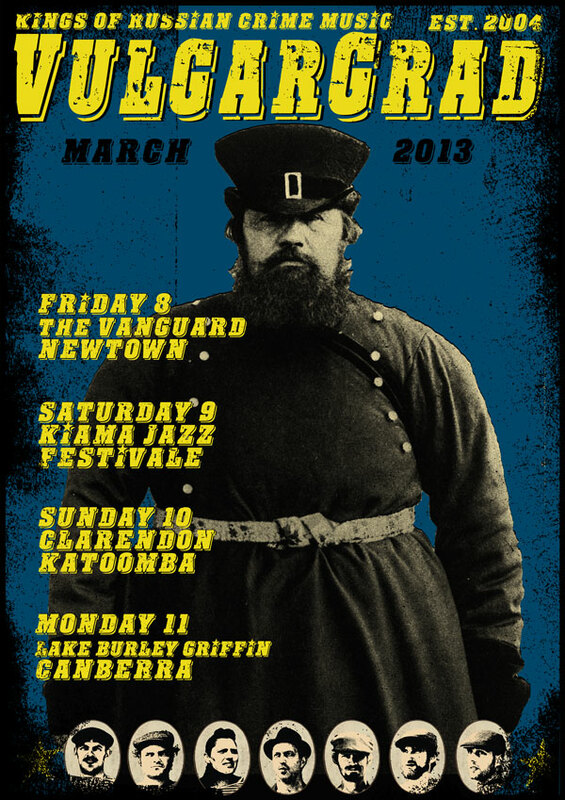 Joining VulgarGrad on the bill for the first time are the new kids on the gulag, Blunderbus – fronted by Melbourne’s very own Siberian fugitive, Misha Doumnov – along with DJ Russian Disco, pumping out bizarre dance tunes from all of the most obscure corners of Europe and the former Soviet Empire.